A perfect table for small space. Well made, functional plus the color is exactly as listed. Good quality product ! Lend modern style to your space with this stylish Aubrieta end table from Copper Grove. Made from MDF with veneers, the single-shelf table features curved feet and a flip-top storage compartment that add charming appeal of the piece. The attractive, rectangular end table is available in a black, espresso, cherry, white, mahogany, or dark walnut finish, making it the perfect choice for your living area. Using end table in small space in entryway. Height between bench and console table perfect for shoulder bag. Flip top like storage bench without drawer facing in wrong direction. Color nice but more of a medium rather than dark walnut. The table arrived and it was in good shape for being shipped. I opened then box to assemble the table and there were no instructions included Having trouble with getting the top on. I figured out the rest of it. Once complete it will look great in my living room. Now trying to find instructions online. Any help would be appreciated. We were looking for a narrow end table to fit into a smaller space and this worked beautifully. The wood is dark but not espresso. It was easy to assemble and has a convienent flip up storage area. We are very pleased with the quality and arrived well packaged so no damage. This table is the perfect size for my space. I bought in white. I wanted somewhere to hide the remotes and this fills that need. It arrived in perfect condition. I had trouble trying to assemble it but I'm not very handy. My brother put it together easily without any problems. It looks exactly as pictured. I'm happy with this purchase. I love this table. It is good looking, low profile and helps me keep my papers off of my desk. I like the option of storing some papers, my TV control and odds and end inside of it. It's also easy to assemble. Good, solid end table we needed to fit a small space. Great end table for the price! This table is perfect on the side of my couch. I needed a narrow table & wanted one that was open but yet provided a space to store the remote for the TV & the ceiling fan. It was well packaged, easy to put together, & I love the black finish. It goes well with my other black furniture. I would highly reccomend this end table. The quality of the table is nice. The brown color is nice and warm and rich and it actually feels slightly sturdy and well made for a very inexpensive table. My only thoughts are that it is not as practical as it seems at first glance. Because the storage top is half the size of the table top, you pretty much can't have anything on the front of the table. I thought it would be great for remotes but since I like to have decorations on my table or a coaster or something it's impractical because every time you'd want to get the remote you'd have to remove what's on top of the table. In hindsight I wish the lid was a smaller percentage of the table to allow for a little more ease of use. If you're fine with no decorations on the table it's great! This end table fits perfectly at the end of my sofa, and has a compartment perfect for storing all the tv remotes that seem to always get lost! There is also a shelf at the bottom, which comes in handy, too. Modern design, and clean lines. I'm very happy with this purchase! Assembly was easy, too. It works in our space and looks nice, though not too stout. My biggest complaint is the horrendous off-gassing stench that persists with it a couple weeks on. You might want to air it out (with the drawer flap up) for a couple days in a neutral spot. Nice for the price! Remember to use the glue and don't over tighten the cam nuts. This is an average table. It’s not something I’d put in a public room. I use it in my craft room and it holds all of my tools. It is functional. I would recommend this based on how you use it. Total waste of money. It chipped on multiple sides and looked cheap. Now a piece of junk down in the basement. Don't waste your money. Even my husband likes this table. Just the right size for between the sectional and the lay z boy and I love the flip top. Nice storage to extra coasters, remotes, cat toys whatever. I love this little table. It went together quickly and easily and the instructions were very clear-took me about 30 min. It hold all my remotes and fits in with my mission style decor. I highly recommend it. As advertised. Fairly easy to assemble, seems sturdy. Perfect for my needs. Was very easy to assemble. Would recommend for small space storage. Not the most attractive , but quite functional. I was surprised by the spacious storage area. Absolutely love love these end tabels for my living room, well made good wood easy to put together. Is perfect to have extra storage in your living room when u have small area. I like the storage provided in this table. It is good quality and easy to assemble. "This table number 20559150 the dimensions are different in the specs category. They give two different widths. Please tell me what the dimensions are. Thank you." This item is approximately 23 inches long x 11 inches wide x 24 inches high. I have the espresso. It is a darker brown. I took a chance when ordering and I am happy with the color. If you click on the color they have listed as espresso, mine are darker than the photo listed. I was on the fence between ordering the black and espresso. Glad I chose the expresso because I wanted more a chocolate brown. Good Luck! "What is the width of the table not counting the lid?" The interior dimension of the flip top is approximately 18.75 inches long x 6.75 inches wide x 3.75 inches high. "i'm confused on dimensions. In one place it says the table is 11 inches wide and in another 7 inches. Which is correct? Please restate all dimensions here." 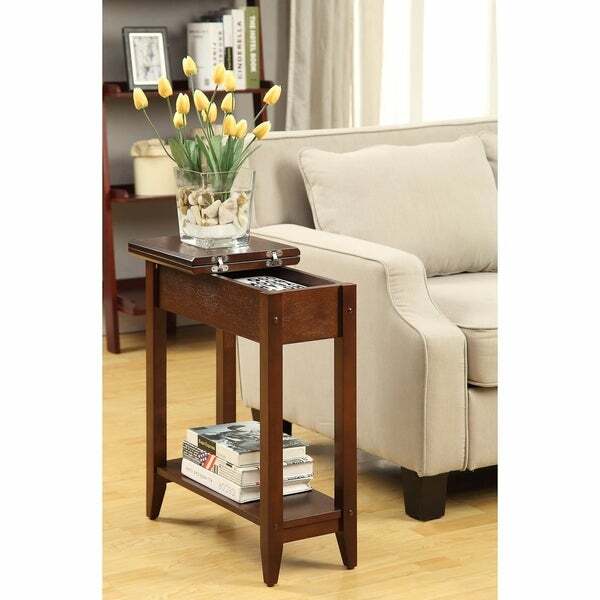 This end table measures approximately 23 inches long x 11 inches wide x 24 inches high. The top of the table is larger than the table itself. It flips up to open the smaller space. "I want to order this table but I am unsure of the colors. Only 2 colors are labled in the pictures.. can you please help." "What are the internal measurements of the tabletop (i.e. storage space)?" The interior dimensions of the flip top end table is 18.75 inches wide x 6.75 inches deep x 3.75 inches high. Size, color, material, and high customer rating.